Proteins and Their Higher Molecular Weight Fragments. 8. Enzymes. 9. Peptides. 10. Nucleic Acids, Polynucleotides and Oligonucleotides. 11. Polysaccharides and Oligosaccharides. 12. Compound Biopolymers and Biooligomers. 13. 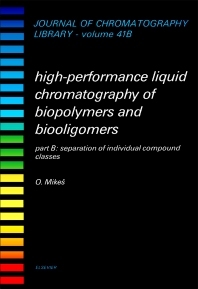 Applications of High-Performance Liquid Chromatographic Methods in Structural Studies of Biopolymers and Biooligomers. 14. Register of Biopolymers, Biooligomers and Oligomeric Fragments Separated by HPLC or MPLC Methods Methods. 15. Bibliography. 16. Prospects for High-Pressure and Medium-Pressure Column Liquid Chromatography of Biopolymers and Biooligomers. Subject Index.